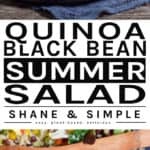 This Quinoa Black Bean Summer Salad is super hearty. It’s perfect as a meal all by itself, but goes nicely with a main course as well. Vegan, gluten free, loaded with protein, low-fat, and ready in 20 minutes! Do you think salads aren’t manly? 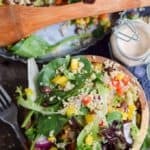 You better check yourself, Johnson, because ain’t nothing weak about this Quinoa Black Bean Summer Salad. Honestly, I’ve never been a big salad guy. But, after reading about Erectile Dysfunction being a sign of cardiovascular problems my thoughts quickly changed! Heart disease is bad enough. But, a limp noodle? No Bueno! Don’t let the simplicity of this recipe fool you. 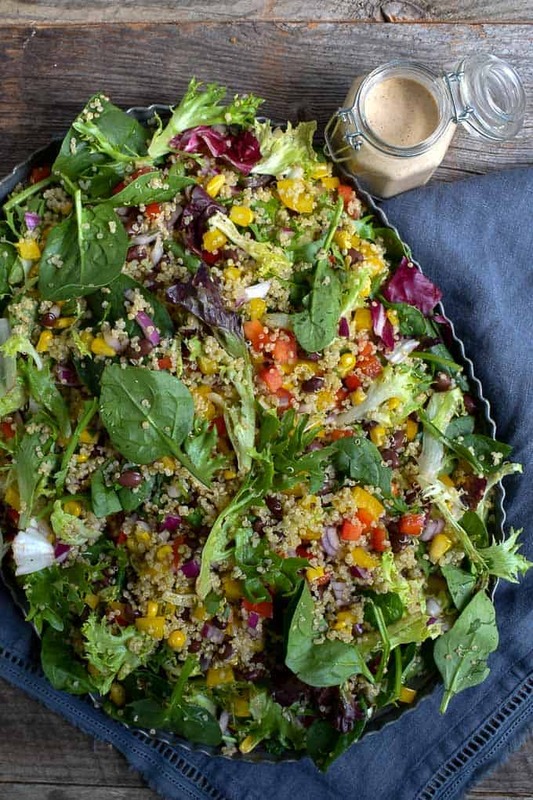 This Quinoa Black Bean Summer Salad is a freak of nature. It’s an absolute flavor bomb. Off the charts healthy. And, it’s easy as hell to make. The hardest thing about this recipe is pronouncing Quinoa. A delicious spring mix is the base for this salad. Next, just add a couple chopped peppers along with a red onion. A little corn and cilantro. Some black beans for meatiness. Finally, the quinoa. And, there’s your salad. As great as this salad is all by itself, it just didn’t seem right to leave it naked. 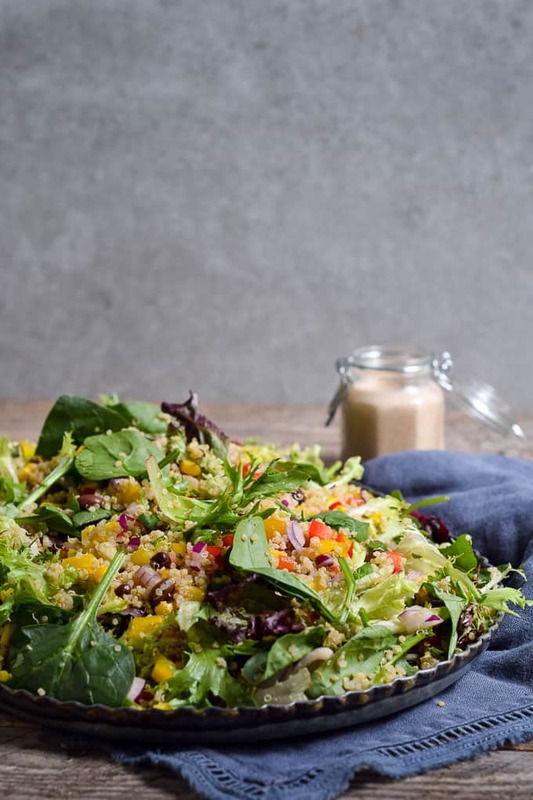 So, I whipped up this amazing tahini dressing to drizzle across the top. Oh, yeah. Pure heaven. It also gives it a little bite. Remember, this is man salad. 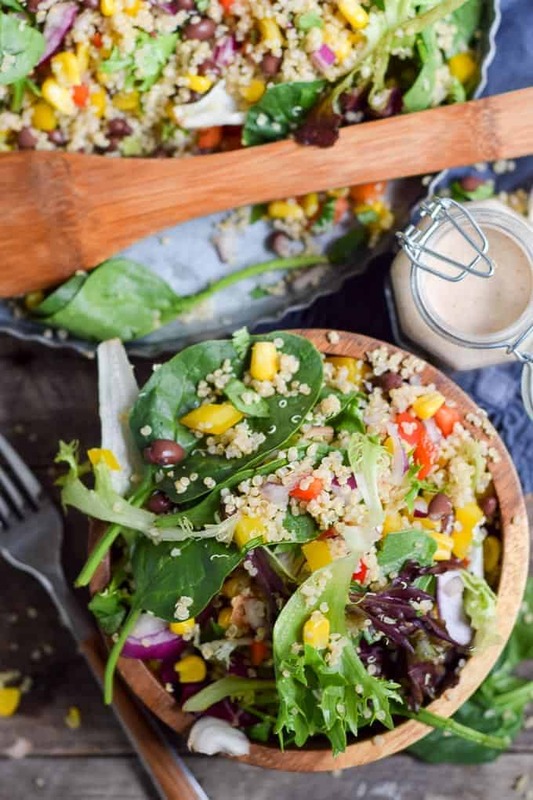 This Quinoa Black Bean Summer Salad is perfect as a meal on its own. But, it’s also great to serve with a main a dish. 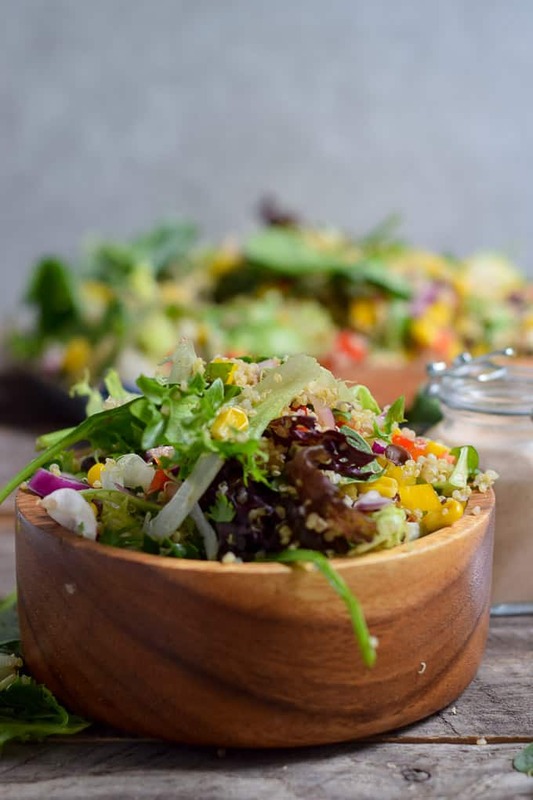 If you’re looking for more salad dishes, try my Quinoa Chipotle Bowl and Three Bean Protein Summer Salad. Both are awesome! If you make this recipe let me know. Be sure and leave a comment below with a star rating. And, share a picture on Instagram with the hashtag #shaneandsimple. I want to see your work. Enjoy! This Quinoa Black Bean Summer Salad is super hearty. Great as a meal or served with a main dish. It’s vegan, gluten free, loaded with protein, low-fat, and ready in 20 minutes! Less if you have leftover quinoa in the fridge. Make dressing by adding all ingredients to a small and stirring well to combine. If you need it a little thinner, add a Tbsp. of water at a time. Set aside. Dice bell peppers and onion and add to large bowl. Roughly chop cilantro and add to peppers and onions. Add black beans and corn and mix well. Add in your salad greens and toss well. Finally, add the quinoa and toss once more. 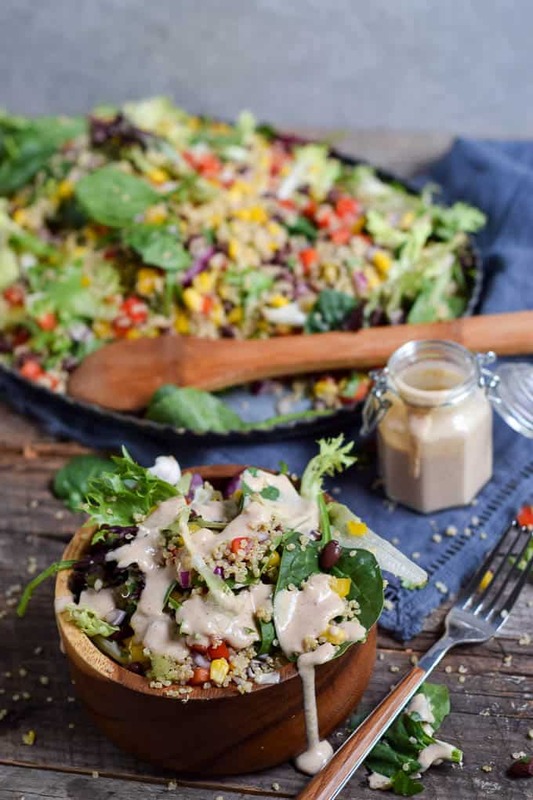 When you’re ready to eat, drizzle with Southwest Tahini Sauce and enjoy! *Nutrition info does not include tahini dressing. This recipe was terrific! The dressing was delicious. I didn’t have any lettuces, but I had cole slaw mix from the store, so I used that. It gave the salad a very nice crunch, and the plus was that, the next day, I used the leftover salad as the base for a stir-fry. I’ll be using this dressing frequently in my rotation. It will go with many things. Thanks so much! Love the creativity of using slaw mix. That’s what it’s all about. Thanks for reaching out. Love hearing these stories and the feedback. Blessings.